I hope you had a great 4th of July. This time of year is state baseball for our youngest son. Today we are playing 2 games!!! I thought it was fitting to create a layout for the new Challenge at Frosted Designs to use 2 or 3 of the following: ribbon, twine, washi tape. I have tons of all three and I found a way to incorporate them all!!! I started out with my Cameo. 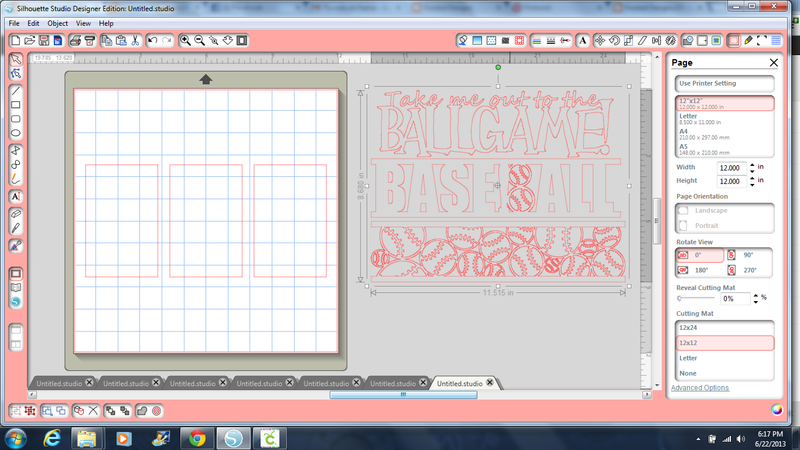 I like to create easy layout designs that I can embellish once I get the photos in. I forgot to save the file (just getting into the habit of this!!!) so I recreated most of it. I used a 12x12 layout frame with three openings for pictures. I used the Baseball borders and sized them to just under 12 inches wide. The font I used to write Storm Chasers 8U is LD Mon Cherie. All of these were purchased from the Silhouette Store. I cut out the frame in the baseball paper. I adhered the top of the baseball paper to a piece of 12x12 white cardstock. I trimmed the sides of the photos by 1/2" and adhered them to the white cardstock so they showed through the openings. I adhered the Baseball title and Storm Chasers 8u on the page. We are the home of the Omaha Storm Chasers (formerly Omaha Royals) and their new stadium is 10 minutes from our house. We collapsed the three select baseball programs in our town into one organization and partnered with them! This is our first season as the Papillion Junior Storm Chasers and it has been a great move overall. I created a banner using twine, baseball ribbon and washi tape under the photos. Here is the page I created to go with it (I am a 2-page scrapper). Here they are as they will appear in Tanner's scrapbook album. It has been a great season for these 7 and 8 year olds. We have won 2 tournaments so far and I hope they play well (and have fun) this weekend at state!!! Go Chasers!! This is a great layout Lori!! Who knew that you could buy baseball ribbon?! I love the way you used all three to create the banner! !